Real estate opportunities on the island Condé Nast Magazine calls the best in the world. I posted this blog a little over a year ago. This past weekend's events instantly took me back to this very posting. Might I please resubmit with the greatest of respect to everyone all around the world whose life circumstances may or may not be as peaceful as they should be? With the headlines emanating from Paris this past weekend, I must say, with the utmost humility, concern and gratitude, that it so nice to live on Maui for a number of reasons. I do recognize that there will be those who will say that, by posting this very blog, I am opportunistic and exploitive. Despite the naysayers, might I respectfully submit that they view things from another angle: from the angle of those who live here on Maui, and put forth a great deal of effort toward keeping aloha alive and healthy. The more we lead aloha-filled lifestyles, the more we reinforce all of life's good things. Here is that blog from a year ago. Read and enjoy, knowing it comes from a spirit of aloha. By no means am I diminishing the problems that the world is experiencing. They're still there. It's just nice to know that, at least here on our little rock in the middle of the Pacific, at least in comparison to the headlines everyone else wakes up to every day, it's breaking news that one of our divers is alive and well and that 93˚ is a record temperature. If that's the biggest news Maui has to offer, sign me up. There is indeed a slower pace of life here. There are tongue-in-cheek bumper stickers and T-shirts sensibly proclaiming, "Slow down. This ain't the mainland." There are occasions in which the line of three or four cars will stop so the mommy chicken and her five chicks can cross the road. It's as though everyone who lives here understands that a Maui life is truly meant to be lived - not merely existed. There's an island-wide culture that gives everyone permission to exhale. Let me write that again: there's an island-wide culture that gives everyone permission to exhale. You don't find that in very many places, do you? You, too, can enjoy waking up to these reassuring headlines now that this lovely 2 bedroom, 2 bathroom, 2-care garage plantation home is on the market. You'll love the privacy afforded by the 2 acres. One would be led to believe that 2 is this property's lucky number! 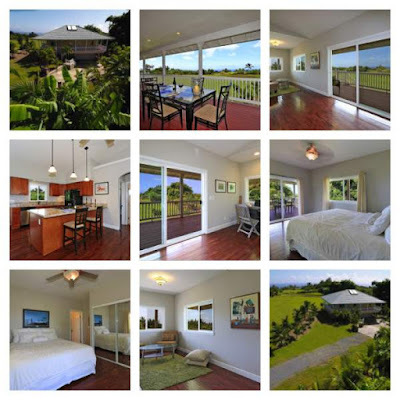 Call or text me at 808-205-2175 to schedule your private showing. See more at https://www.facebook.com/120-N-Holokai-Road-866087360150115/?ref=hl.